A fire pump is a part of a fire sprinkler system’s water supply and can be powered by electric, diesel or steam. The pump intake is either connected to the public underground water supply piping, or a static water source (e.g., tank, reservoir, lake). The pump provides water flow at a higher pressure to the sprinkler system risers and hose standpipes. Fire pump service (s) may include a fire pump test and listing for its use specifically for fire service by a third-party testing and listing agency, such as UL or FM Global. The main code that governs fire pump installations in North America is the National Fire Protection Association’s NFPA 20 Standard for the Installation of Stationary Fire Pumps for Fire Protection. 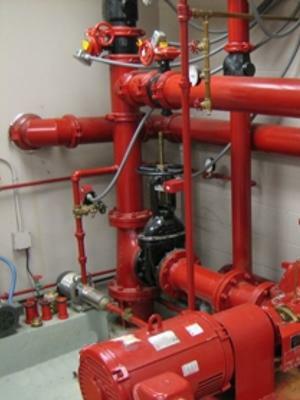 A fire pump is an important component in many building sprinkler systems. The pump provides a higher level of water pressure than most municipal water systems and can often be found in high rises or buildings that use well water as part of their sprinkler system. Fire pumps take in water and provide it to sprinkler pipes at the correct pressure, which helps to put out fires more quickly and effectively. To ensure a fire pump will function correctly, however, it is important to choose the right unit for the job. Buyers should consider factors such as design, power source and system compatibility to find the best fire pump to meet their needs.